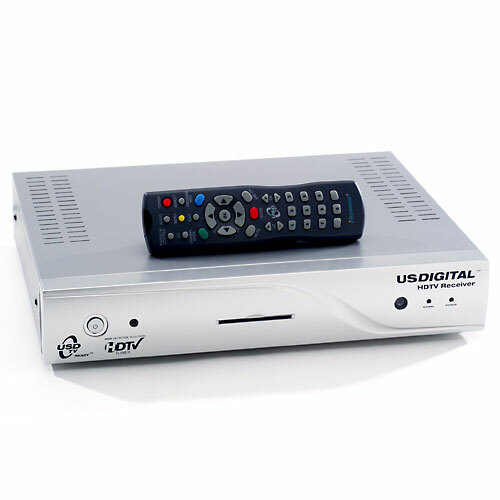 US Digital (USDTV http://usdtv.com/) sold an HDTV Receiver called the DB-2010 manufactured by HiSense. The unit runs an embedded Linux 2.4.18-12 kernel, with usb-storage compiled into the kernel. They swap MTD flash RAM partitions 1 and 4 with each new firmware update (similar to Tivo). http://www.ati.com/companyinfo/press/2003/4628.html - related press release? The box has a card slot on the front, but there is no card reader behind the slot. It has a single USB port on the back that can be used to upgrade the firmware. This uses the AMD/ATI Xilleon 225, a MIPS processor. of the software used in the USDTV receiver that is covered by these licenses. for download elsewhere on the Internet. Some other emails have gone back and forth, but no sources have yet been made available to Tim Riker. USDTV filed for Chapter 7 bankruptcy in the US District Court of Delaware, and approximately 6600 receivers (many new in box) were sold on July 17th 2007 at 10:00AM at 12552 S 125 West, STE 200 Draper, UT (upstairs @ DAW Group Bldg). For those of you that never received a firmware update, here is the update. It contains GPL code yet we have no method of extracting only that code. As the GPL portions are freely copyable, and not extractable, the package itself must also be copyable. Were it not so, the GPL would be violated, and I'm sure they would never do that. With no further ado, here are the packages. REMEMBER TO NOT INCLUDE THE DELETEME.txt ON THE USB STICK or the upgrade WILL FAIL. The two different installed firmware images appear to use different digital signatures. This is why one firmware update will not run on the other machine. It is expected that they can be swapped, but we are not publishing this information yet. We expect to publish extracted filesystem images here soon. If you have other GPL-containing firmware updates you would like posted here, please contact Tim Riker. Guide-Aspect-Exit-Aspect-Guide - turns on/off a setup -> diagnostics menu including "stream info"
This page was last edited on 4 December 2010, at 01:17.